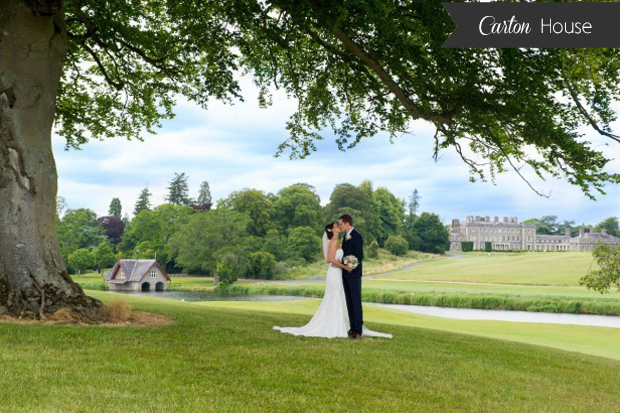 Located in the pretty village of Straffan, Co. Kildare and on the banks of the River Liffey, The K Club is surrounded by 550 acres of mature woods, parkland and magnificent formal gardens-perfect for your wedding photographs. The Resort can cater for large and lavish weddings or more intimate affairs. The Legacy Suite, The Arnold Palmer Room, The John Jefferson Smurfit Room and The Pantheon Suite all offer various options and can cater from just 14 people in The Pantheon Suite right up to 350 guests in the Legacy Suite. The enchanting Kilkea Castle is located in Castledermot, Co. Kildare, just an hour’s drive from Dublin. 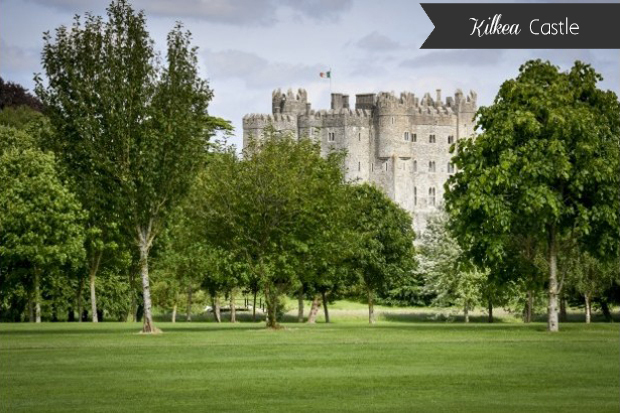 Once the medieval stronghold of the FitzGeralds, Earls of Kildare, today it can be your own fairy tale setting for your special day. Set on 180 acres of woodlands and gardens, this stunning 12th century castle blends its historic past with contemporary elegance. The magnificent Baronial Hall can host up to 280 wedding guests and has the wow factor with elegant chandeliers and traditional feature stone wall. It also has a range of luxury accommodation including 11 beautifully appointed guest rooms, 24 Carriage Rooms connected by a charming walkway to the old courtyard buildings and 33 self-catering lodges, which overlook the 18 Hole Golf Course. 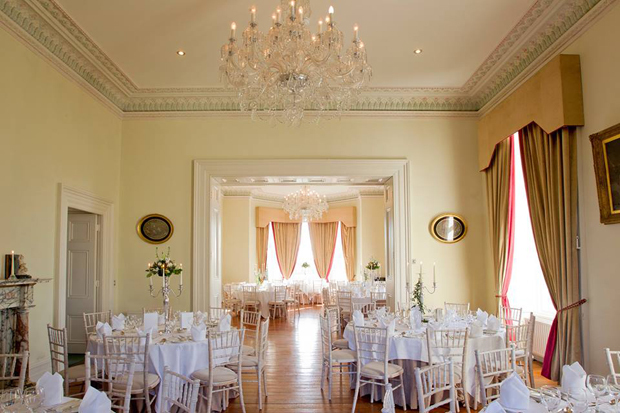 Nestled in 1,100 acres of stunning parkland, the historic Carton House is a charming wedding venue with modern luxuries. Intimate celebrations and drinks receptions can take place in the main house – a restored 18th century Palladian mansion boasting stunning original features while larger parties can celebrate in the stylish chandelier lit ballroom. Their Modern Silver Ballroom is a luxurious setting that can host up to 360 guests – its expansive size allows for versatile layouts with a moveable stage and dividing walls. Their dedicated team will help you every step of the way from flowers to menus and place settings to centrepieces, sharing their wealth of experience and knowledge. 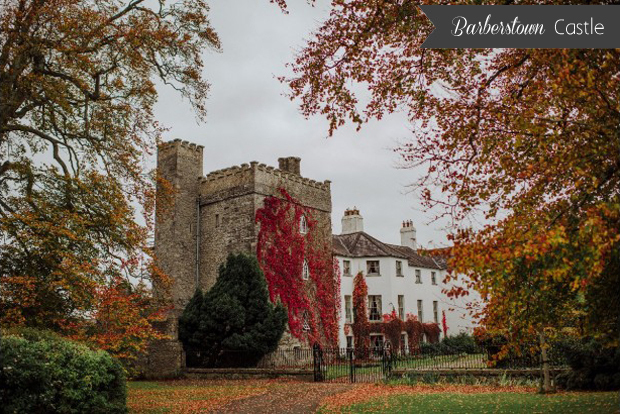 Located just 30 minutes from Dublin city and Dublin airport, Barberstown Castle is the perfect location for a destination wedding in Ireland. The castle originally dates back to 1288 and its medieval decor, with its high ceilings, impressive tapestries, cast iron chandeliers and exposed wooden beams and stone walls, brings a very tangible old-world feel to the magical banqueting hall. It is truly like stepping back in time. 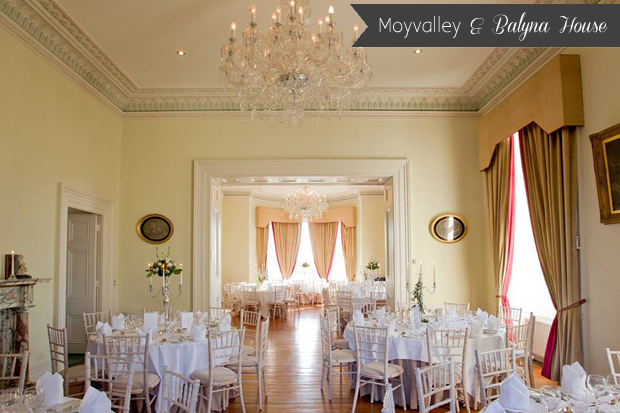 Moyvalley Hotel & Golf Resort is the perfect blend of traditional and contemporary and has not one but two stunning wedding settings for couples. The chic, contemporary Moyvalley Hotel is the perfect venue for larger celebrations of up to 250 guests, taking place in the elegant Royal Canal Suite. Or if you’re after a more intimate gathering, the charming Balyna House is a palatial 19th Century Italianate Mansion that can cater for up to 100 guests. Lovingly restored to its original splendor, it boasts gorgeous period features including an ornate staircase and stained glass dome as well as its own private Cellar Bar and has stunning panoramic views of the surrounding countryside. 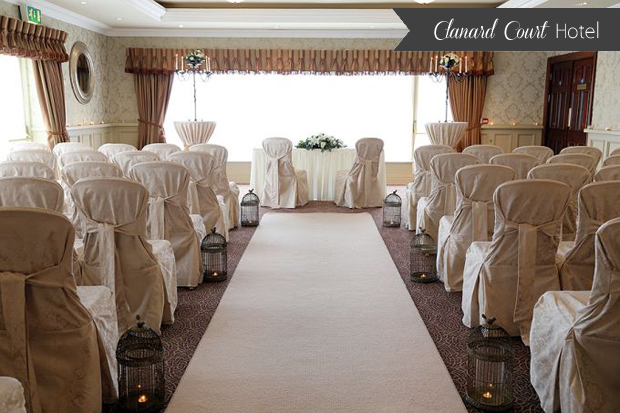 The 4-star Clanard Court Hotel in the heart of Kildare is a family run business specialising in tailor-made weddings. They have a ‘one wedding per day’ policy so you have their undivided attention for your entire celebrations. Overlooking the Garden Terrace, their romantic FitzGerald Ballroom boasts floor to ceiling windows with a view of the beautiful private gardens and can host up to 260 guests. Or if you’re planning a smaller affair, they have a selection of more intimate locations as well. Their beautifully landscaped gardens will provide endless photo opportunities and civil ceremonies and blessings can be held onsite as well. 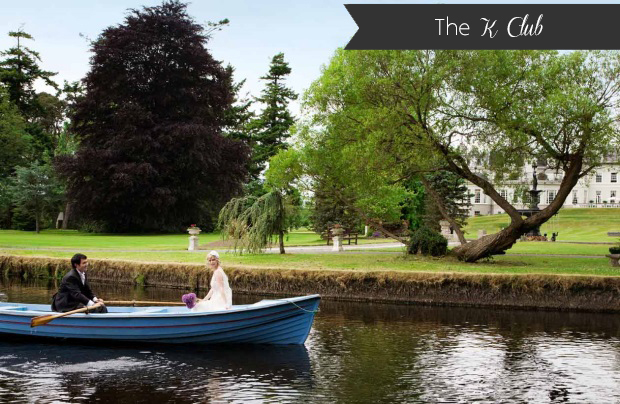 Just 20 minutes from Dublin city, this 18th Century private manor sits among 700 acres of beautifully manicured gardens with peaceful rivers and lakes, making it an idyllic setting for wedding photos. A rooftop garden makes for a stunning backdrop for a drinks reception, while the traditionally appointed Biddle’s Bar provides all the comfort of a local, making it a great spot to finish off the night with your guests. 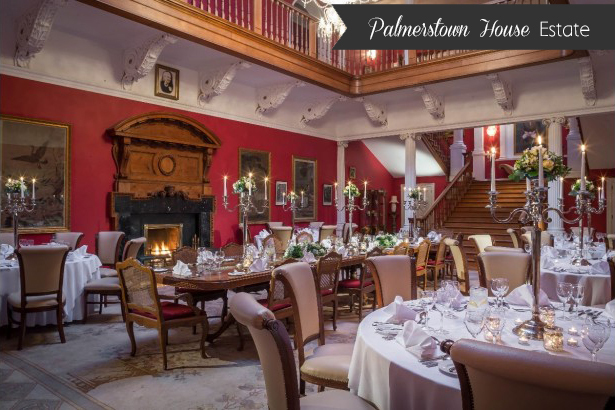 Palmerstown House Estate‘s interiors are just as beautiful as its surroundings with deep red walls and huge chandeliers, making it a magical setting. One of the oldest family run hotels in Kildare and with over 45 years’ experience in the business, the O’ Loughlin family prides themselves on their unrivalled reputation for quality combined with a warm and professional service. 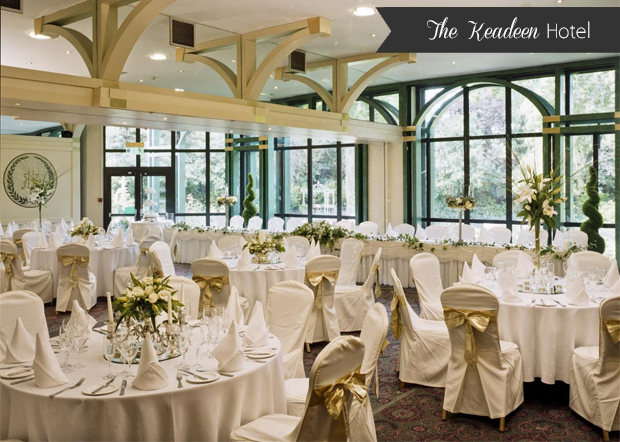 The Keadeen Hotel have a one wedding a day policy and ensure that you’re the centre of attention for the entire day! Their beautifully manicured gardens provide a picture-perfect backdrop for your wedding photos and drinks reception alike if the sun is shining, and couples can choose from the elegant and spacious Ballroom or light-filled Garden Room to continue the celebrations. 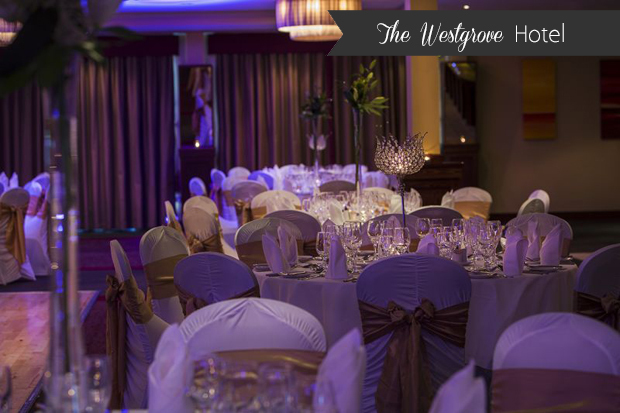 The 4-star Irish family owned Westgrove Hotel in the picturesque Clane is already well established as an extremely popular venue for weddings and host just one wedding a day. The two main wedding suites – the O Connell Suite and the Alexandra Suite – both feature a private bar and dance floor and are both bathed in natural light. In addition to the suite for the main celebration, there are many other areas in the hotel which form an integral part of the day such as the grand staircase which proves popular for photographs. On arrival, guests enjoy exclusive use of the chic Cigar Bar which opens onto the terrace and links to the Rooftop Wedding Garden. Celbridge Manor Hotel is the perfect blend of elegance and tranquillity just a short drive from Dublin city centre. Couples can look forward to a warm welcome and red carpet arrival before enjoying all this charming venue has to offer. Their beautifully landscaped Georgian gardens provide endless photo opportunities and if you’re blessed with the sun on your Big Day, you can avail of the stunning walled gardens for your drinks reception before retiring to one of their elegant reception rooms. 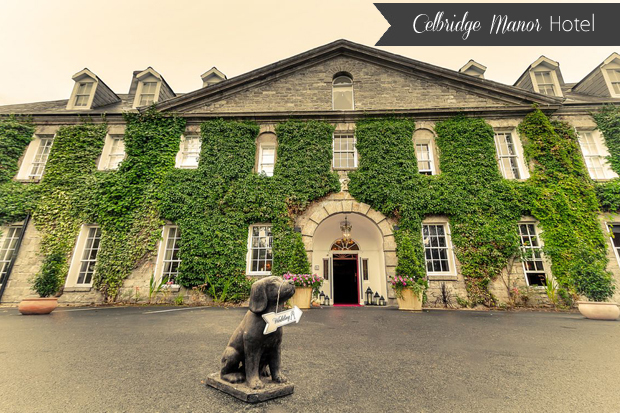 Celbridge Manor Hotel can entertain up to 300 guests and can also cater for smaller, more intimate affairs as well as civil ceremonies. 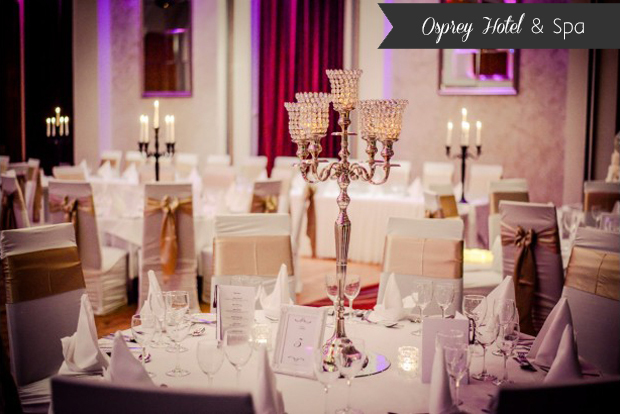 Immaculate attention to detail is priority for the wedding team at the multi-award winning Osprey Hotel and Spa and with just one wedding a day, you have their undivided attention. Let your guests indulge themselves in the confines of the umpteen treatments on offer at the luxurious Soul Spa. Avail of the sumptuous Bridal Suite situated in one of the resort’s two penthouses, which boasts a hand carved marble bath and its private balcony provides spectacular views of the surrounding countryside. Built in the 1830s, Martinstown House is an exclusive country house that boasts beautiful period features with a cosy, homely feel. They can host weddings with up to 150 guests in their marquee, which is right next to their Walled Garden, a popular spot for photographs (the gardens can also be used for civil ceremonies). Their lavish drawing rooms are perfect for smaller, more intimate parties. Not far from the marquee is a sunken camp fire with tree trunk benches where guests relax and toast the newlyweds by a roaring fire. 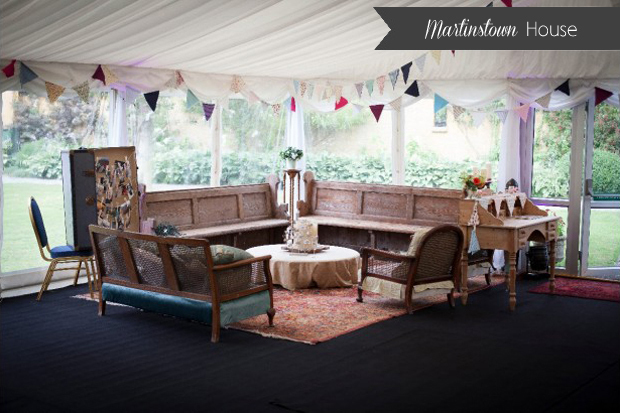 Martinstown also has a vintage VW campervan onsite that couples can avail of for their celebrations. The Springfield Hotel offers a location steeped in cultural history and quaint splendour. Nurtured under the experience of the Hannigan family, this venue has acquired a reputation for quality and assurance. The bespoke vintage décor of the Anna Liffey Suite strikes the perfect balance of accommodating a large capacity of 80-250 guests within intimate surroundings. They can also cater for more intimate weddings in one of their two specially appointed private dining rooms. 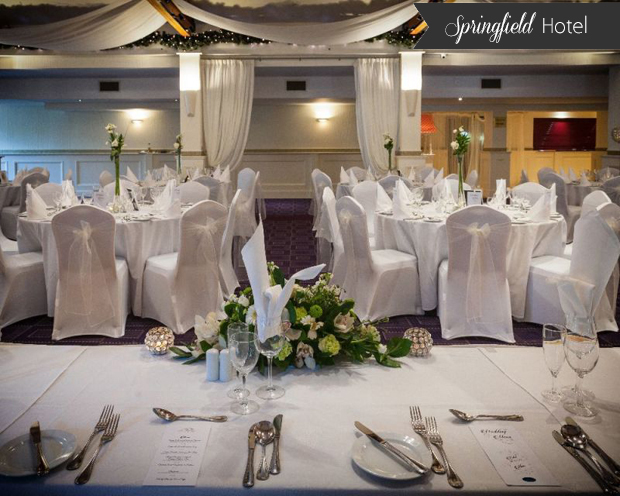 Celebrating over 40 years of hosting wedding celebrations, the team at the Springfield Hotel host just one wedding per day so you have their absolute attention.